I’m currently taking this bad boy home this weekend for a family reunion. Jealous much? Have you guys ever taken the megabus? I know they are only in certain cities. Luckily I am lucky enough to have a megabus right in my city and in Detroit too (heavy sarcasm). 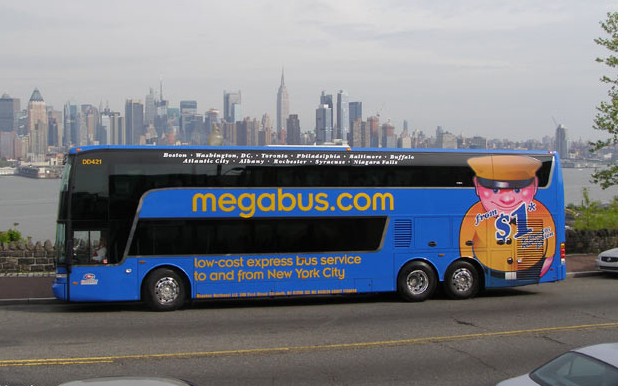 Before I had a car, I actually took the megabus a lot when my parents were too cheap to buy me a plane ticket when I went home. What, you think just because I’m 26 I should be paying with my own money? Well then I would probably go home once a year. I’m working on a budget here and sometimes new clothes come before family, you know? I am very lucky that my parents are nice enough to pretty much always pay for my plane/train/automobile when I do come home. And really we all win. I don’t have to pay and they get to see me! The thing about the megabus is that I have had some bad experiences in the past. One weekend, Meredith and I were both taking the MB to get back to Detroit for Christmas. This lucky morning, we took a cab down to Union Station where the bus leaves from. I was a little bit naive about the workings of the Megabus at this point and therefore wore only a thin sweatshirt, a thin peacoat, no gloves, no scarf, no hat. This was on December 22. Not smart in the least. Mer was dressed similarly—great minds think alike obviously. We shivered in line for about 30 minutes before we really started wondering where our bus was. Yeah, it was snowing but not heavily and it seemed like the bus would be able to make it there within 30 minutes of delay! We asked around to the few (maybe one?) employee that we saw, but they had no idea. Apparently they continued to radio our bus but it wasn’t responding. Did the bus crash? What was going on? 30 minutes turned into an hour, then two, then three. All standing in the cold. I have vague memories of Mer and I running back and forth to buses that pulled up to yell at ask the driver where the next destination was. Minneapolis,Milwaukee, St. Loius, multiple times. But never Detroit. We switched off going inside to the train station to ‘warm up’ for 5 minutes at a time before the other person called almost crying and begging to switch. Why couldn’t we both go inside you might ask? Because we never knew if our bus was going to show up at any minute and leave us behind. We developed minor frostbite on our hands. I called my dad crying frustrated and frozen tears and asked him to check if there was a last minute flight I could get on. He said he wasn’t my travel agent and hung up on me. I sent him pictures of my purple and white hands, hoping that his cold heart would warm up at the sight. We called the megabus number over and over again only to get hung up on. Finally we realized they had no more of an idea where this mystery bus was than we did. After a solid 2 hours, we realized there was a ‘warming bus’ near the end of the line of buses. Why would there even be a warming bus if these buses were usually on time? But that is another story. Of course it was full but we eventually got 2 seats– small miracle. Then, a megabus employee told us they had given up on our bus arriving so they would charter another bus to take us. One problem was they didn’t have a driver. I offered to drive, but they shot me down. We asked this employee to drive, no luck. Finally after hours of frustration, we called a friend who was driving to Ann Arbor. The reason we didn’t go with her in the first place was that she was leaving in the afternoon and we needed to be back by early evening for an event that night. Well, it was now early afternoon and she was leaving! She was nice enough to pick us up and my brother then came and got us in Ann Arbor. Ironically, yet not, our megabus finally arrived just as we were leaving. By the way, my dad’s heart did thaw a bit as he eventually called back with flight details and one I could get on. A little late! Another time, I went to Ann Arbor for the weekend to a Michigan game and was scheduled to bus back Sunday night. Two of my friend’s, Alex and Jimmy, were on the same bus back. Turns out they had overbooked it by a lot and so we had to wait an extra hour or so for them to ‘find’ a second bus (seeing a pattern here?). The new bus pulled up and the driver promptly told us it was her second day and first time driving a bus! We were in the second and third rows so could hear extra clearly when she spent the entire time yelling things like ‘whoa, it’s really windy’ while the bus was swerving all over the highway and ‘this is a pretty bad storm, I can barely see’ while we are getting honked at repeatedly for her traffic violations. It was a pretty scary ride and I’m pretty sure we all stayed awake and wide eyed the entire time. This time, it being summer with no chance of rain, I figured it wouldn’t be as big of a problem as far as delays and it wasn’t (so far)! Plus, they have free wi-fi so I’m blogging away and doing stuff online. I chose this over driving because I couldn’t imagine spending anymore time in my car and I figured I could get some blogging time in and read and sleep. Once I am not spending 3 hours a day in my car, it will be a different story. The megabus also always stops at the same rest station which has Burger King, Taco Bell and Popeye’s. Gotta have some variety. The bus always reeks after this stop of greasy food. blah. I had some extra time due to my half day today so I packed a salad! I just asked for a to-go box from the cafe at work and they gladly gave me one for 27 cents. That way I wouldn’t have to worry about holding onto tupperware or anything and we also had plastic silverware left over from the BBQ. So, I just chopped up some lettuce, mixed with celery, sunflower seeds, a little bit of feta and buffalo chicken and doused in protein ranch. Shook it all up, delish! Protein+fat+green veggies. If you were driving instead of busing, you could easily make this into a wrap instead of a salad–so that it was a little more on the go friendly. Some other foods that are great for travel? 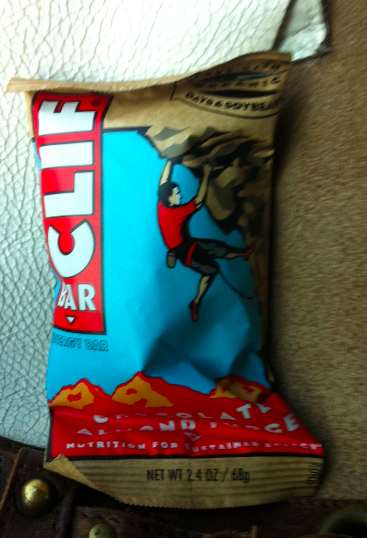 Bars–I brought a clif bar for dessert! Apples and bananas are some of the best travel snacks because they are easy to eat while driving and they won’t go bad (usually) if you leave them in your bag for awhile. 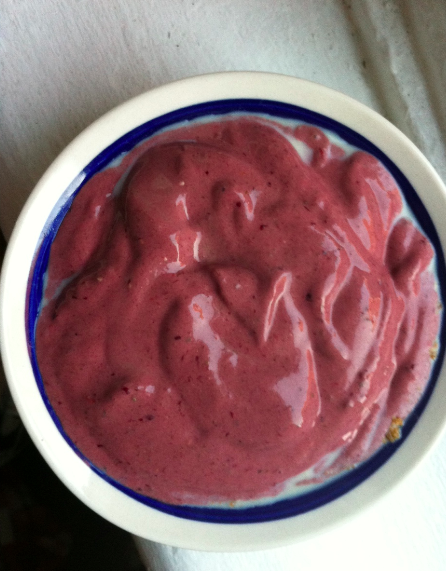 Protein smoothies work well too! Make them a tiny bit thinner so you can drink instead of eat with a spoon! I ate drank one earlier today in the car so I could go directly to the gym after work. Since I had a half day, I would have been starving and cranky had I not gotten some food in (I got to the gym around the time I would normally eat lunch). Now I’m going to read my book and/or sleep–hopefully sleep but no guarantees on this thing. Also…Something you might be interested in: Because I don’t like milk and recently haven’t been having much dairy, I am always paranoid that I’m not getting enough calcium. This site lets you enter foods you eat to see if you are getting enough. Turns out, I’m not! Ahhh, buying a supplement first thing tomorrow so I don’t get osteoperosis. Hope everyone’s weekend is off to as great of a start as mine If only the lady in front of me would put her seat up a bit…my legs are jammed into her seat. Another megabus success.